In 1880 mention is made of a “house” when Rebecca Allen obtained it for $45.00 at sale her son, Thomas M. Allen, inherited the property and owned it until it was sold to Ira M. Rishel in 1895. 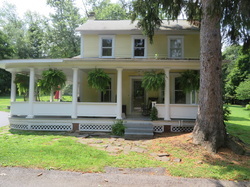 At that time there was a two-story frame house with a stable and buildings a later owner, remembered as an excellent carpenter, was William H. Stover (the grandfather of Mrs Fred (Louise) Kline). In 1948, the property was purchased by the Dale McClintics.